Selecto - Bistronomique & comptoir; That is what it says on their menu and basically describes what you can expect in this restaurant/bistro, a mix of a low benchmark bistro combined with the culinary approach of a gastronomic restaurant. A duo formula where you choose 2 dishes will cost you 33€, the trio formula will set you back 39€ and that is a good price/quality ratio! 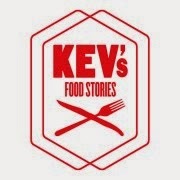 The menu offers you a nice choice of original interpretations of classic dishes like saltimbocca of suckling pig with Tiroler speck,fried polenta and eggplant gratin or a veloute of 'Puy' lentils with breaded mussels. All quality products. 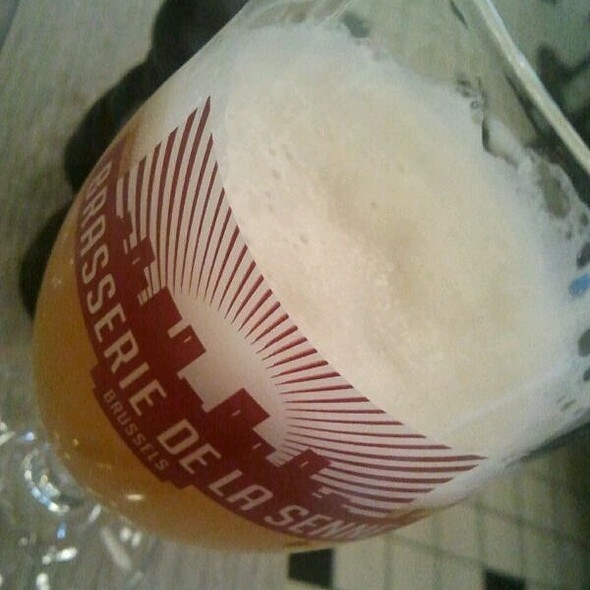 I start with a tasty beer from the local Brussels brewery 'Brasserie de la senne', a Taras Boulba. A fairly light, crisp blond/white beer with a fruity,hoppy taste. A nice way to start my lunch. I prefer having a good beer over champagne/cava as apéritif lately and certainly when it's a quality beer like this one. 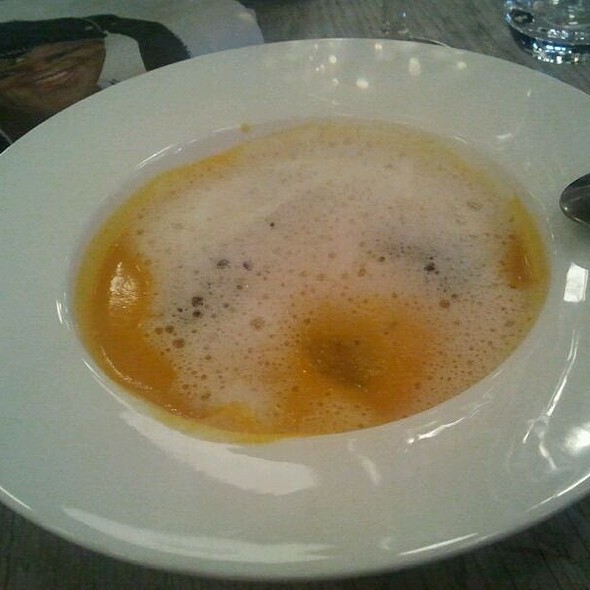 As first course I had set my mind on the 'Puy' lentils but unfortunately they were sold out so they offered me a velouté of pumpkin with breaded mussels and a foam of what I suppose was a fish/shellfish reduction. The foam was needless, didn't really contribute to the dish, both in taste and presentation but the velouté itself was rich, savoury and the plump, breaded mussels were tasty and gave the dice a nice bite to it. My main was a nice piece of skinseared seabass on a crumble of butternut with Buffala mozzarella, Cévennes onions and cider butter sauce. 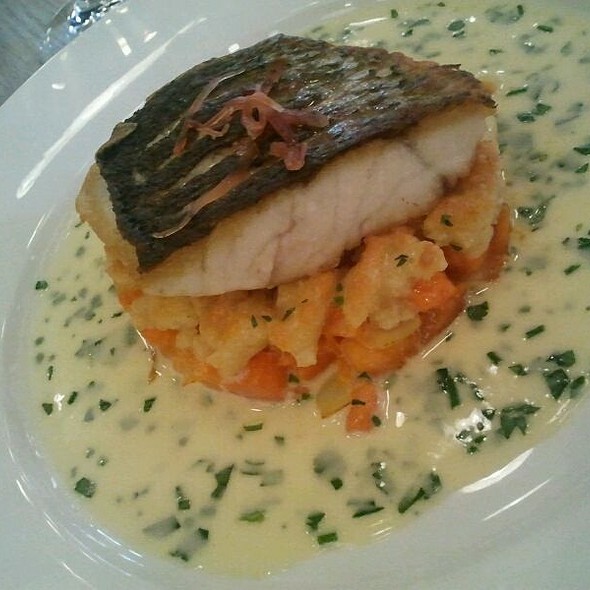 The fish was prepared perfectly and the 'crumble' was savoury, the melted mozzarella added a nice 'cheesyness'. Finished with an espresso and left satisfied. More of this in Brussels please! !